Harley-Davidson’s Road King has had a heart transplant. His faithful but tired Twin Cam 88 has been ripped-out of his chest, with a new muscular Milwaukee-Eight slotted in, breathing new life into old bones. So as we approach a quarter-century of Road Kings, does this American monarch have a future coming from Donald Trump’s capitalist republic? NEW ENGINES have been coming thick and fast from Harley-Davidson. Last century it took decades for the Motor Company to move from F-Head to Flat Head to Knuckle Head to Pan Head to Shovel Head to Evo. But since the Twin Cam 88 was introduced in 1999 we’ve seen the Twin Cam 96, Twin Cam 103 and now, for 2017, the Milwaukee-Eight. Looked at another way, it’s only the third all-new big twin in 80 years. Harley-Davidson was no doubt developing a new motor to comply with the latest international noise and emission laws, but I’m guessing the company might have also been spurred on by Indian’s 111 Thunderstroke fitted to all the large-capacity machines. The Milwaukee-Eight is being built initially in 107 (1750cc) and 114 (1870cc) cubic inch capacities with four valves per cylinder – Harley-Davidson’s done that before, but only a handful of racebikes have had four-valve-per-cylinder heads, not streetbikes. The Milwaukee-Eight is powering the touring range in 2017 – Road King, Street Glide, Road Glide and Ultra Limited, but there are some variants to the engine too. The most obvious feature is the capacity, with the CVO Limited and CVO Street Glide getting the larger 114 motor. Some models feature oil-cooled heads while Ultra Limited and CVO Street Glide have liquid-cooled heads. Market researchers told Harley-Davidson that riders wanted more torque in their touring bikes, particularly when carrying a passenger. They also wanted improved cooling and improved reliability without losing the characteristic Harley-Davidson V-twin feel. Harley-Davidson’s engineers decided to adopt the four-valve, twin sparkplug approach with higher compression and just a single camshaft to make the power, with a balance shaft to control the tingles. The four-valve heads with two sparkplugs allows for faster burning, reducing heat. 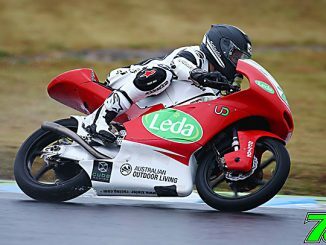 Much of the heat which is produced is controlled by the oil or liquid-cooled heads, increasing engine longevity and reducing the heat transmitted to the rider. The forked rocker arms and hydraulic tappets actuating the valves should require no maintenance for the life of the engine, which is pretty remarkable. Having a balance shaft is new, but it isn’t designed to cancel out all the vibration, rather to create a Harley-Davidson-like feel without shaking the fillings loose. The balancer works in harmony with the rubber engine-mounts of the touring line-up to create a bike everybody can enjoy. Idle speeds have also been dropping, with the Milwaukee-Eight happy at the lights doing just 850rpm. 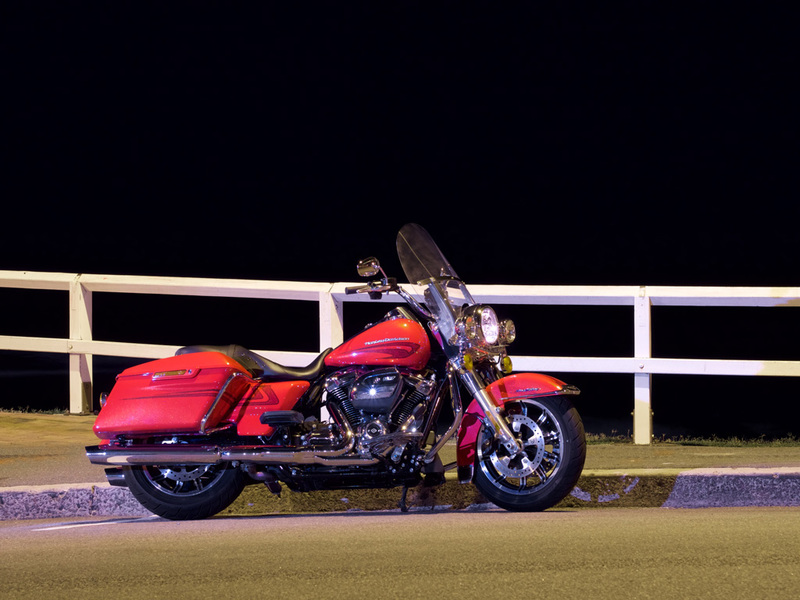 That’s one of the points of owning a Harley – the Road King shakes and throbs at idle like a big traditional twin should. Roll off the line and the increased torque improves acceleration while the balance shaft and rubber engine mounts induce a level of smoothness which makes the ride enjoyable without being sterile. And in many ways that’s the point of the Milwaukee-Eight – it’s attractive to riders who might otherwise have bought a different brand while being attractive to Harley riders looking to trade-up. The smallest of the Harley-Davidson touring bike line-up, the Road King features classic styling which dates back the 1950s with a classic touring screen and hard cases to make it a bagger. Both can be quickly removed to lighten the look, but you’ll need to get the tools out and remove the crash bars to make it narrower. Up front is a big circular headlight and running lights, wide-spaced forks and a massive mudguard covering the wide 17-inch cast wheel. The 22.7-litre fuel tank has the Harley-Davidson-signature fake filler cap/fuel gage on the left, unlockable filler cap on the right. 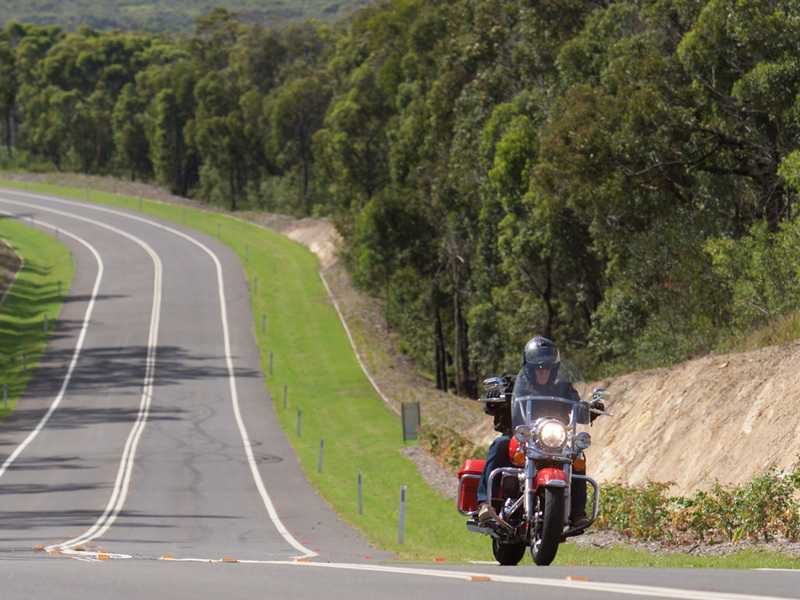 As it comes from the factory, the Road King is ready to go on tour – but maybe not too far. The screen is so high even tall riders have to look through it, and there’s no weather protection for hands, feet or legs. Luggage capacity is great for solo or two-up short trips, the panniers swallowing 64 litres of luggage, which is enough for many people most of the time, but there’s no standard way to easily add more luggage – however a journey through the Harley-Davidson accessory catalogue will turn up options. For day rides and weekends though, the Road King is fantastic. The panniers are easy to use, flipping the lid outward with the latch on the inside of the pannier. Unlike so many conventional panniers, everything doesn’t want to fall out when you open the lid, so using these panniers when you park the bike is a joy – ideal for cameras, hats, handbags and handguns, but you might want to put the change of clothes in a soft overnight bag, because you won’t want to carry the panniers to your hotel room. As I mentioned, they do come off the bike easily, thanks to a pair of hand-operated mounting screws inside each pannier, which is especially handy for accessing the rear shocks’ remote preload adjuster, which I recommend you do when adding a passenger and a load – it’ll make the King a bit more Royal and less like a juggling jester travelling down Australia’s hideous highways. Well, I’m not sure what happened, because the Road King doesn’t have the greatest seat in motorcycling, although it’s not actually bad. Indeed, it’s another reason I say the bike is great for day rides and weekends, because it’s only on the long haul you’ll start to wish his Royal Highness was a few millimetres higher. Overall comfort has been improved though, new suspension at both ends going some way to reducing the pounding on our royal derrieres compared to older Road Kings. The riding position is upright and proud. The high handlebars induce a straight back, the slightly forward-set floorboards with heel/toe controls sitting just where you expect. It’s an easy riding position, the wide ’bars offering leverage when jockeying the big King while being comfortable on the road – at least while the screen is in place. Remove the screen – a 10-second job – and the riding position becomes tiring if you’re on the highway as the wind wants to push you off the back. For this I’d like ’bars a bit lower and wider, but then it might be uncomfortable when the screen goes back on but I at 183cm tall I think it would be worth it. So if I owned a Road King I’d get a smaller screen or lower ’bars for the summer, and go back to stock in the cooler months. It’s somewhat back-to-the-future with the suspension, Harley-Davidson dumping the air shocks at the rear (which hardly anyone ever actually adjusted) for hand-adjustable units. It’s a bit of a shame the knobs can’t be accessed until you remove the panniers but at least you don’t need an air hose. The new 49mm conventional forks use ‘dual bending valve fork technology’. This basically means at low suspension speed the forks are plush, but damping increases if the suspension speed increases – over large bumps and into potholes, for examples, which in turn offers comfort most of the time and control when you need it. For a motorcycle which tips the scales at 379kg ready to ride, our King didn’t mind trying to keep up with the jokers out there when the time was right. He’s a beast to manoeuvre and feels chubby off the sidestand, but he carries his weight well when charging along the blacktop. Proud and stylish, our new King makes his predecessors look downright pedestrian. For a start, his Milwaukee-Eight motor is making more power and torque than any of his ancestors, his new mill spinning up much more readily than the old, pushing him to higher speeds quicker. The new suspension means more control in the twisties and having a steering damper up front helps, too. 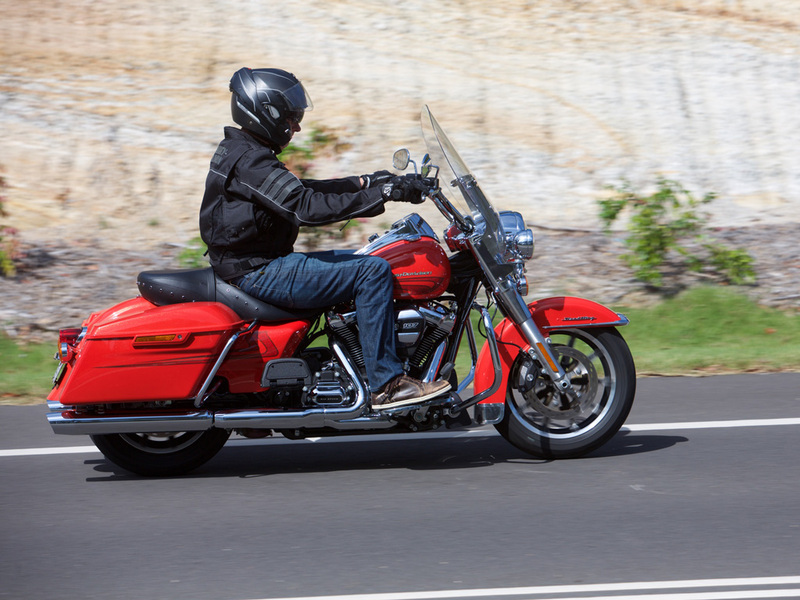 The Road King does everything better than you expect for a classically styled, heavyweight touring machine. Even cornering clearance is better than I expected and a big improvement over the other 2017 Harley-Davidson I’ve ridden, the Fat Boy S.
Who can stop The King? You can stop The King. It’ll take a bit of a squeeze on the lever and a push on the pedal, but the Reflex Linked Brakes will pull the Road King up, and there’s ABS hidden away preventing lock-ups, too. Optional in some markets, the linked and ABS-equipped stoppers are the only way you can buy the bike in Australia, but I found them fine. There’s a pair of discs at the front and a single at the rear, all gripped by four-piston calipers. The linking doesn’t kick-in until you reach about 40km/h, so there’s no front end dive if you use a bit of rear brake in a U-turn… and because His Royal Highness is about a mile wide, I don’t recommend filtering. Are you good enough for The King? Well, maybe rich enough is a better question than good enough – your Harley-Davidson dealer will ask you for at least $33,995 plus on road costs for a new Road King, but I don’t think that’s too bad. Being built on the touring line, the Road King is more comfortable than anything other than the even-more-expensive touring bikes, but it’s got the classic 1950s American style. It’s more capable than a Softail in nearly every respect, and doesn’t cost much more than any of them. That’s not to say it’s great value for money. With a $34K Harley-Davidson that’s very much in the eye of the beholder, but if you have a desire to own what could be described as the most classic of the modern Harley tourers, you will love being His Highness’ faithful servant and pilot. 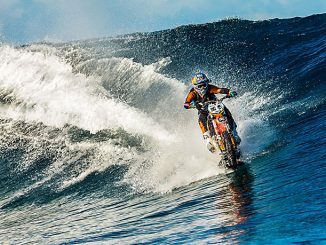 Will Robbie Maddison sink or swim? Harley-Davidson and Marvel have unveiled ‘Super Hero Customs’, a collection of custom Harley-Davidson motorcycles inspired by some of the most powerful and iconic Marvel characters.